Hang on to that History! Imagine waking up to the news that your home will be demolished. Perhaps you look forward to a new house in a nicer area; you long to get away from a place that has been neglected for too long. But you will lose the community spirit, and may be far from the shops and services of the town centre. And there is history in your home; so many people have been born, married, lived and died there. The houses may be solid Victorian terraces simply in need of some love and care. Even if it is too late to save the buildings, it is important to record that history. This challenge faces the residents of Bootle on Merseyside. 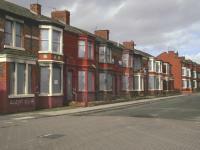 A regeneration programme begins in January 2005 and although some houses and buildings will be refurbished, many will be demolished. Jan Byers is coordinating a last-ditch attempt to save more of the old Victorian buildings and to record their history. Jan says; "Can you imagine the panic this caused? Residents were in the streets discussing the letter they had received. People were asking where they would go; what would happen next; when would they have to move? Residents and shop-keepers put notices up in their windows; "Leave our homes alone! "; "Leave our businesses alone!"." Jan asks "Why is demolition the only answer?". Jan has found out that the Earls of Derby originally owned much of the land. The town was a seaside resort in its early years and expanded with the development of the docks. Villas were built for the merchants and terraces for the dock workers. Other residents commuted by train to work in Liverpool. Bootle's economic decline began in the 1960's and 70's from the time the docks closed, although new office blocks housing government departments and the National Girobank arrested this decline. Jan Byers' challenge is to build a case for saving the heritage of Bootle while not blocking re-development which will lift the morale and economy of the town. Simon Tyrrell-Lewis of the period house website 'Bricks & Brass' commented; "Why are these Victorian houses not valued? There will be more history lost all over the UK now that the Government is determined to move investment away from the south-east." Simon Tyrrell-Lewis launched Bricks & Brass in 2001 to share his enthusiasm for period houses. With over 300 pages of information, Bricks & Brass serves some 25,000 visitors every month.